Once again, I found this months Daring Cooks Challenge to be quite intimidating. Ceviche is fish or seafood that is “cooked” in lime or lemon juice. In a restaurant I wouldn’t hesitate to order it, but making it at home had me worried about food poisoning. I read up on the safety of making your own ceviche and found that the most important thing is to have fresh fish. If you don’t have a trusted fish monger, the secret is to buy fish or seafood that has been frozen at sea. Freezing at sea means the freshness is basically locked in. 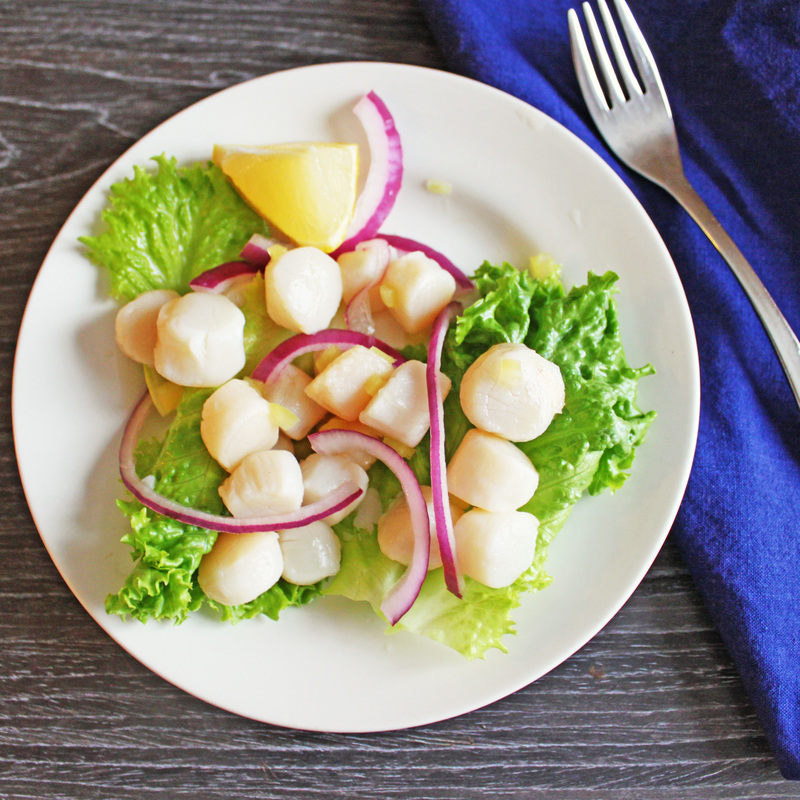 I chose to use Argentinian scallops that were frozen at sea. At my local grocery store they come in packages that are vaccum sealed; if you use the same ones make sure the seal isn’t broken. If it is the scallops may be freezer burned. 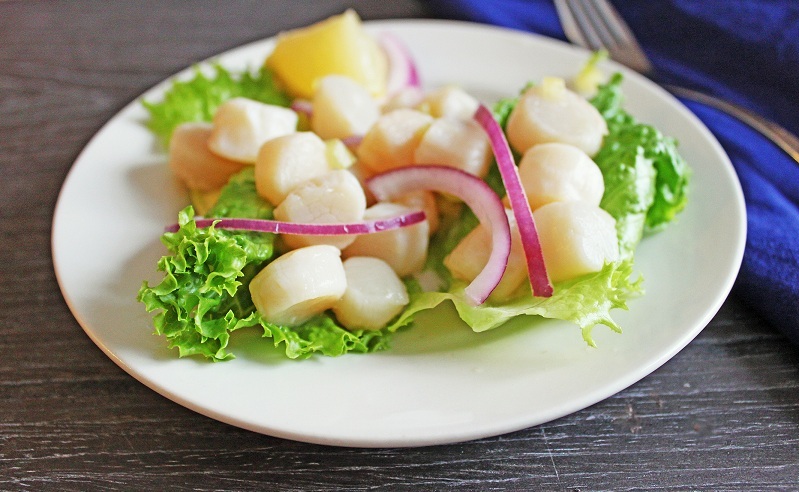 Argentinian scallops are quite small so I didn’t cut them into pieces. Even though I used all the precautions I could when making the ceviche, I was still very nervous about eating. I took a bite. It tasted good. I took another, then another. I finished my plate, then waited. No food poisoning! This was a ceviche success! I was also going to make the Papas Rellanas. Papas Rellanas are fried mashed potatoes with a ground beef filling. I was sure I had the ingredients on hand, but it turns out I was missing quite a few. Instead of making something that was very far from the original recipe, I chose to skip that part of he challenge. Combine the lime juice, garlic, chili and coriander. Pour over the scallops, making sure all are covered. Put sliced onion on top. Let sit for 10 minutes as it “cooks”. Lift fish out of lime juice mixture and serve with sweet potato or corn. I too have been wary of trying ceviche at home, but happened to have just made some the other day and it was delicious! Your ceviche looks beautiful! You followed all the precautions so there’s no reason it shouldn’t turn out thoguh I understand your nervousness! Beautiful pictures! I’d be nervous about making this at home too, but it sounds to me like you nailed it. It really looks delicious. Thanks for the tips on how to buy the fish! I am Peruvian and I have never ever tried this ceviche before are you sure is from Peru? ?